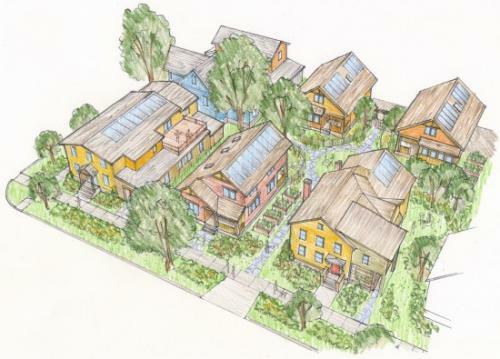 The Aurora Pocket Neighborhood is the pilot project of New Earth Living in Ithaca, New York. Pocket Neighborhoods are similar to co-housing and small lot cottage development, except smaller in scale and cooperatively owned. The small scale allows for uncomplicated resident management and makes Pocket Neighborhoods easier to place on small urban lots within existing established neighborhoods, preserving and incorporating existing buildings. Buildings are constructed to inherently conserve energy, incorporating numerous green building technologies. The Aurora Pocket Neighborhood is exciting and fulfilling to live in. It is located in the beautiful Fall Creek neighborhood of Ithaca, near many waterfalls and parks, highly rated schools, shopping, dining, and entertainment. All of these amenities are walkable, reducing resident car dependency and increasing opportunities for social interaction in a vibrant environment. Other inclusions like the shared bicycle shed allow residents to experience resource dependency and social equity. This is an amazing community where we can let others learn from us about living sustainably in community!